I walked into the store last week and behind the counter was the most beautiful window I had ever seen! I love texture. I will just collect windows and doors because they have beautiful textured glass in them. What do I do with them? Ha, just lean them up against the wall! I found this beauty and decided I had to have it! I would love to incorporate it into a home some day. I just worry that we will sell it and the window will have to stay…..it would be weird if there were a hole, right? So, it will probably always be a decorative piece. When I saw this window it reminded me of one that I saw many years ago and did not buy. Regret. It always happens that way, doesn’t it? You don’t buy something and you regret it. Do you ever buy things you regret you bought? I do…..but, not this window. I was not going to let it go! I wasn’t even going to haggle on the price! I had to have it! My first thoughts were to hang it in front of the window over my kitchen sink. This way I could see it every time I walked into the kitchen or was sitting at my desk working (the kitchen table ;)). That would require going to the hardware store and getting hooks and chain and then making a burlap cover to go over the chain…..who has the time for that? I do wish I did! I cleaned it up….it was SO dirty. It’s pretty fragile, too. I was worried about just leaving it laying around while I procrastinated going to the hardware store. 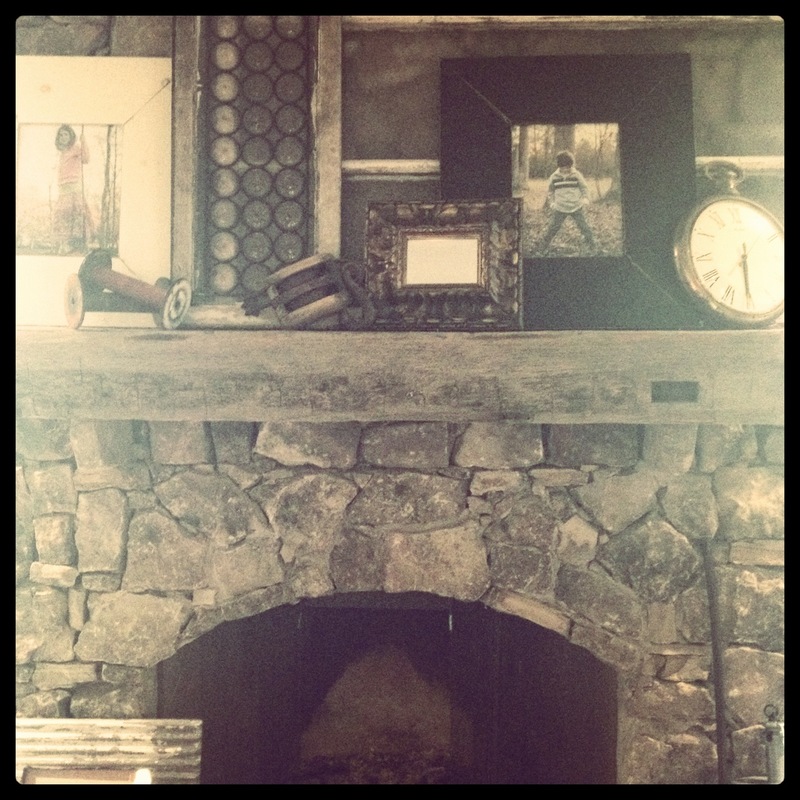 I decided it could sit on my mantel with another textured window that has been up there for several years! I dug around the garage and found a few more cool pieces that were waiting for a place to live and came up with this! I really love it. It is in our keeping room that is right off the kitchen….so, I see it every morning and can see it from my “desk”! Of course, I Instagrammed it, ’cause that’s the cool thing to do! One of my favorite parts of this job is helping businesses create an atmosphere that is warm and welcoming. We work with retail shops and restaurants all the time. You may have heard of Billy Reid? If you’ve ever been in one of his stores, you will see lots of Southern Accents pieces. I need to gather some photos and share with you! In the meantime, we have been working with the Gee family on their newest location in Tuscaloosa, Alabama. With the opening of this store, they have 5 locations. 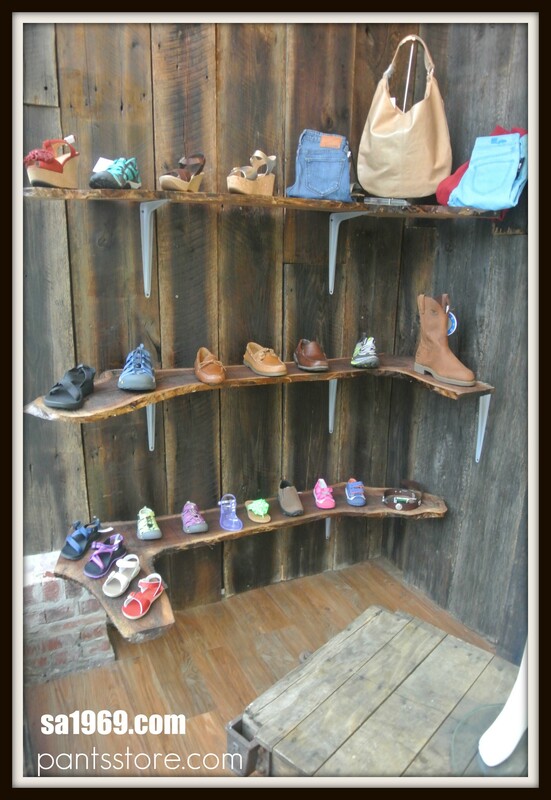 They are located in the old furniture building in downtown Tuscaloosa. Michael came up to look at table ideas and different pieces for displays. He was working with a shelving company and had a lot of the big pieces already worked out. We were happy to help him find a few unique items that would add character to this new location! I went over to the opening day yesterday and took lots of photos. I was thrilled to see the visions come through. This could possibly be one of my favorite things of all time……(I know you’ve heard that before). Really, I loved this saloon door the minute I saw it. It has a beautiful crackle finish that has been created naturally over time. The green color gives it lots of personality. Katherine (the buyer) needed something cool for a jewelry display. We decided this would be perfect! Of course, I took them out to the gym. I was trying to talk them into using salvaged wood (didn’t work). I wanted them to see first hand that if there is a place to buy salvaged wood in Alabama, it was here! Michael and I had talked about creating some tables out of trees like we’ve built for a few clients. We didn’t have any big pieces like those, but we did find several funky shaped ones that were about 10 inches deep. Hello, shelving! I loved this idea. I had forgotten about it until I saw them yesterday…in the front window! Oh My! I love how they turned out! Right now they have all those colorful shoes on them….so fun! There’s one of those industrial carts in the window, too. Everyone needs one of those!! They knew before they even got to the store they wanted old, colorful doors for the dressing rooms. Lucky for them, we had just what they were looking for! We went to the back and started digging through all the doors to find the perfect ones. We wanted them all to have their own personality and man, do they! Notice they are all different sizes. Not a contractor’s dream, but what are you gonna do? 😉 I love that they all have very unique hardware, too! This mirror, oh this mirror! Garlan pointed it out to me and I wanted to grab it and hide it! It was just the door at the time, but isn’t it the most awesome door you’ve ever seen? I would’ve just brought it home and leaned it up against the wall to look at! Of course, when he pointed it out to me…..everyone else saw it, too. (we are going to have to work on that!) Michael loved it and we decided it would be great with a mirror in it. For jewelry, perhaps? No, they decided it would be a shoe mirror! YES! When I saw it yesterday, I thought it was upside down…then I noticed my shoes…hello, the best idea ever! I guess you can tell I like it! So now, maybe you feel like you’ve been to the Pants Store in Tuscaloosa. Did I mention, it’s more than just pants? Oh, so much more. I ended up coming home with a bag full of dresses and shoes! It’s Easter, right? We all need a new dress! I hope you have a peaceful Good Friday! Sometimes, we go out and find the pieces that you see at the store. Sometimes, someone just brings all the goodness to us! This week a guy came by with a truck full of doors! We LOVE doors. It’s amazing how many different reasons people have to buy doors. We sell to crafters, home improvement, furniture making, just because I love it’ers, and then there are those that really just need a door for their house for the reason that it was created in the first place! We got in a door for each of type this week! When we post chippy paint doors on Facebook, we always get a HUGE response! If they are colorful, we sell them immediately. If they are just chippy white doors, it takes a day….sometimes two! They have to be the most popular item we have. It helps that you can go to Pinterest and find a really cool idea for that chippy paint door! I could digress right here and talk about how much I love Pinterest….but, I will save that for another day! Let’s look at some of the doors we got in this week! This 5 panel is very popular in the table, headboard, bench, chalboard-making group! A door with a unique color is coveted by the photographer set! It makes a great backdrop! These doors have a little color and can bring some fun personality to a party or wedding! 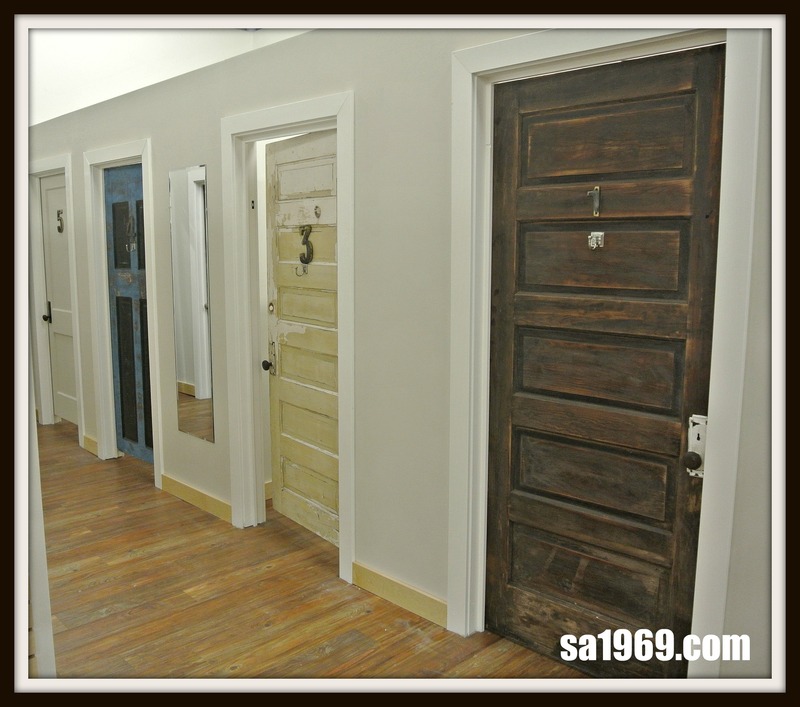 I LOVE these pocket doors…I want some in my house! Wouldn’t they be great for a master bath? Ok, don’t like these too much. They may be going to my house! This is a group of chippy doors we got in on this truckload. That mustard color one will go FAST….get them while you can!